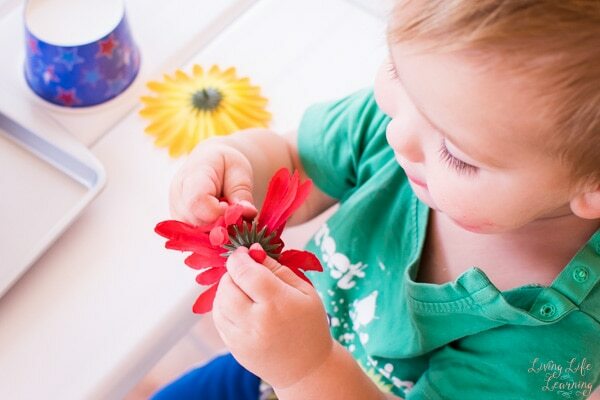 I love how babies and toddlers get so engaged with super simple activities and stay busy exploring and using the materials for quite a long time! 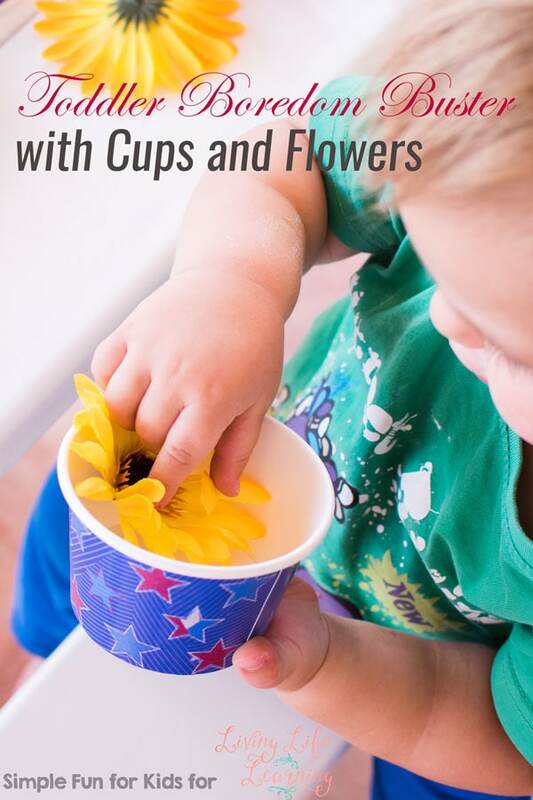 I set up this Toddler Boredom Buster with Cups and Flowers as an invitation to play that was very easy to put together, quite colorful, and open-ended. My toddler really liked it and played with it for a long time! Paper cups. Any kind will work, bonus points for cups of different sizes. We only had one size, though. Artificial flowers. Real ones would be even more awesome if you have them! 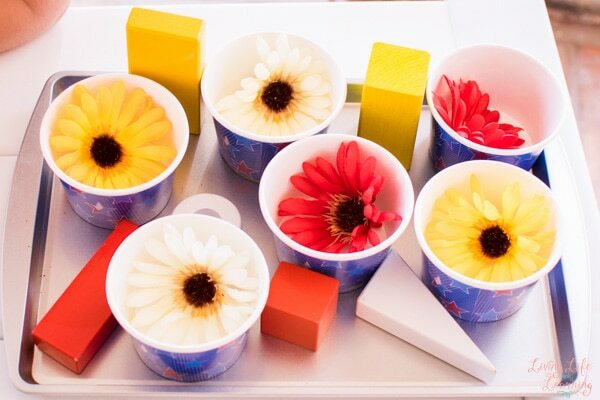 To set up this invitation to play, I simply placed six cups on the cookie sheet and put one flower in each. I chose two flowers in each of three colors: yellow, red, and white. When N saw the materials, his eyes lit up, and he started picking up cups and flowers immediately. He spent some time exploring one of the red flowers in particular, and I told him all about the color. The red stars on the cups were a happy coincidence, and I pointed out that they were the same color. 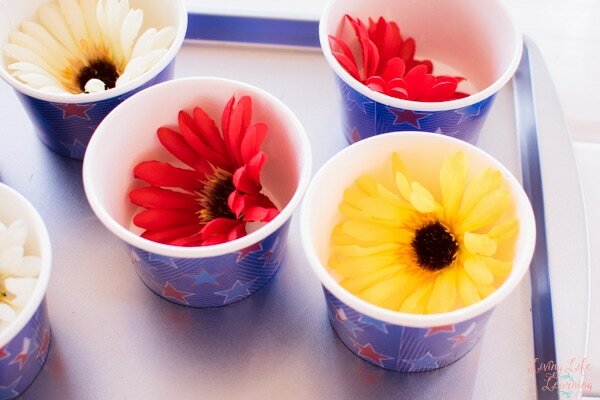 He tested how the flowers fit into the cups by taking one out and putting it back in repeatedly. 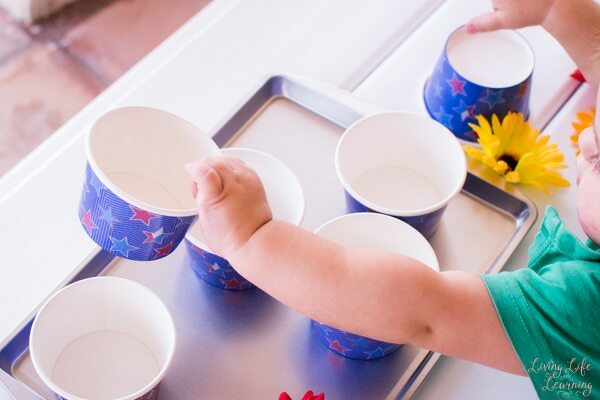 Finally, he settled on his favorite part of this simple activity: Stacking up the cups, putting them one by one on the cookie sheet, then stacking them up again. He did this many times. 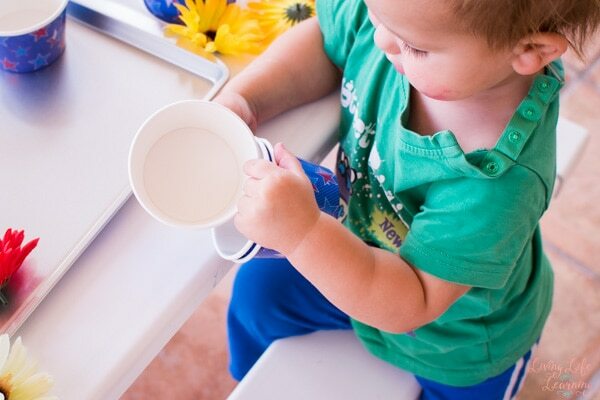 Periodically, he got a silly little gleam in his eyes, started screeching, and throwing all of the cups on the floor before picking them up and starting over. As a little extension, it was E’s idea to add some wooden bricks to the cookie sheet when N lost interest. We went with red, yellow, and white bricks to match the flowers. N liked that, and he played with the bricks for another few minutes before it was time for dinner. Toddler Play with Plastic Eggs and Pom Poms. 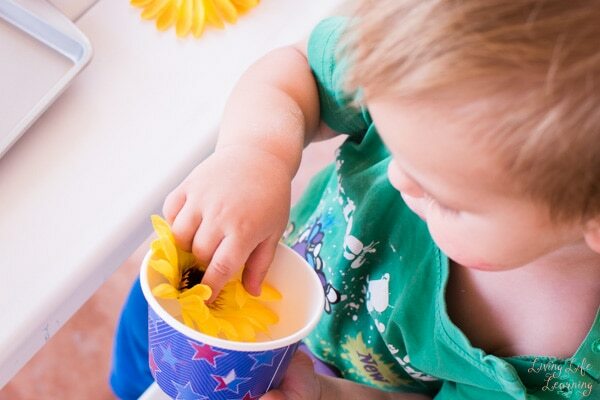 If you don’t mind a bit of a mess, we had lots of fun with Goopy Grass Sensory Play and a Flower Sensory Soup. 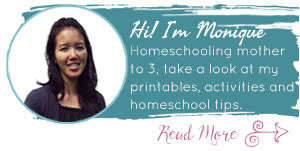 Neither of these activities is messy messy, but you’ll have a little bit of clean up afterward. Yes! Tina comes up with the best stuff.